Ekpe (pronounced “eck-pay), a “musical philanthropist” and artistic director of GENIUS UNLIMITED, specializes in children’s music and cultural entertainment. 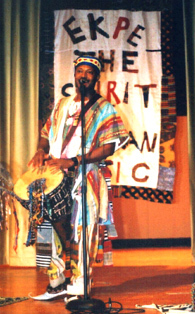 Since his career began in 1974, people of all ages and cultures have enjoyed and been enriched by Ekpe’s performances, recordings, workshops, and lectures. His motivational learning workshops on self-esteem, creative thinking, conflict resolution, drug prevention, and gang awareness have been well received by students, teachers, and administrators. As a musician, producer, recording artist, songwriter and arts educator, he plays African instruments (djimbe drum, kalimba (thumb piano), shakere, and others), flute and saxophone. He gives entertaining and educational performances at schools, churches, festivals, colleges and universities, and is currently promoting his two CD’s entitled, “I AM A GENIUS” and “THE SPIRIT OF AFRICAN MUSIC.” His interactive music video “DON’T TOUCH A GUN” has been recognized and used as an effective means of keeping guns out of the hands of children. At Shelby State College in Memphis, Ekpe was a music major and theater/drama minor and later began studying African music with Master Drummer Souleymane Diop of Senegal, West Africa. After leaving college, he traveled nationally and internationally as a member of recording group Galaxy (Arista Records), touring Canada, Germany and Japan. As former lead drummer and musician with Nubian Theatre Company, he performed in the Bermuda Islands, the Kennedy Center for the Performing Arts in Washington D.C. and the National Black Theatre Festival. 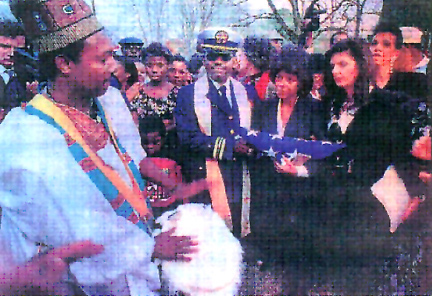 In 1992, Ekpe was requested to play at the burial ceremony for ROOTS author, Alex Haley in Henning, TN. He traveled to Kenya in 1989 and performed with the Bomas of Kenya. Other performances include: The Art Institute of Chicago, the Sejoung Cultural Center in Seoul, South Korea, and the National Black Arts Festival in Atlanta, Georgia. In Paris, France he performed and composed music for “Black Boy: A Tribute to Richard Wright” with Blues City Cultural Center and in 1999 he performed in Holland at the 20th Blues Estafette (Festival). He has also performed “THE SPIRIT OF AFRICAN MUSIC” on the nationally televised Bobby Jones Gospel Show. When President Nelson Mandela received the 2000 International Freedom Award from the National Civil Rights Museum, Ekpe & Company presented him with the call of the drums. Ekpe believes President Mandela’s quote that says, “A country that does not care for its youth can never achieve success”. Most recently he recorded with saxophonist Kirk Whalum on the soundtrack for a documentary about HIV/AIDS in Africa and on his latest CD.